Feb. 4, 2002, was a tough day for stocks. The S&P 500 dropped by almost 2.5 percent, led by a 16 percent plunge in Tyco International (NYSE: TYC), a popular stock that was already down almost 50 percent on the year. Enron Corp had already collapsed under the weight of financial irregularities, while accounting scandals Tyco International and WorldCom had shaken investors’ confidence in the equity market. With these distractions dominating the headlines and memories of the dot-com bust fresh in many investors’ minds, the initial public offering (IPO) of a Philadelphia-based master limited partnership (MLP) with a market capitalization of less than $500 million attracted little attention. Nevertheless, the underwriters managed to generate enough interest to price the IPO at the middle of their expected range of $19.00 to $21.00 per unit. Ignoring this fledgling publicly traded partnership turned out to be a costly mistake. This track record is even more impressive when you consider that the S&P 500 tumbled by 23 percent in the first 12 months after Sunoco Logistics Partners went public. And if you had purchased units of Sunoco Logistics Partners at the close of the stock’s first full day of trading and held your position, you would have locked in a distribution yield of about 8 percent and would be sitting on a total return of over 2,225 percent. A $10,000 investment in Sunoco Logistics Partners on the day of its IPO would equate to 485 units that pay an annualized distribution of almost $3600, equivalent to a yield of about 36 percent. Sunoco Logistics Partners’ strong returns demonstrate the importance of evaluating MLP IPOs and identifying the best opportunities before the market catches on. The majority of fledgling MLPs are structured to offer a compelling yield and grow their distributions rapidly in their first few years as publicly traded entities; these qualities tend to attract investor capital. A MLP usually comprises two entities: an operating limited partnership (LP) and a general partner (GP) that receives compensation for managing the operating partnership’s assets. Not only does the general partner receive a regular payout from any common units that it owns, but in many cases the GP also holds incentive distribution rights (IDR) that entitle it to a progressively higher proportion of the LP’s incremental distribution growth. An MLP’s IDR schedule is usually structured in a manner that encourages the GP to drive distribution growth at the LP level. Sunoco, a Philadelphia-based refiner and pipeline owner, created Sunoco Logistics Partners and contributed all of the MLP’s initial assets. At the time of the IPO, the sponsor accounted for two-thirds of Sunoco Logistics Partners’ annual revenue. This table outlines Sunoco Logistics Partners’ IDR structure. Note that we adjusted this schedule from the one in the MLP’s original prospectus to account for a 3-for-1 stock split that occurred in early 2011. 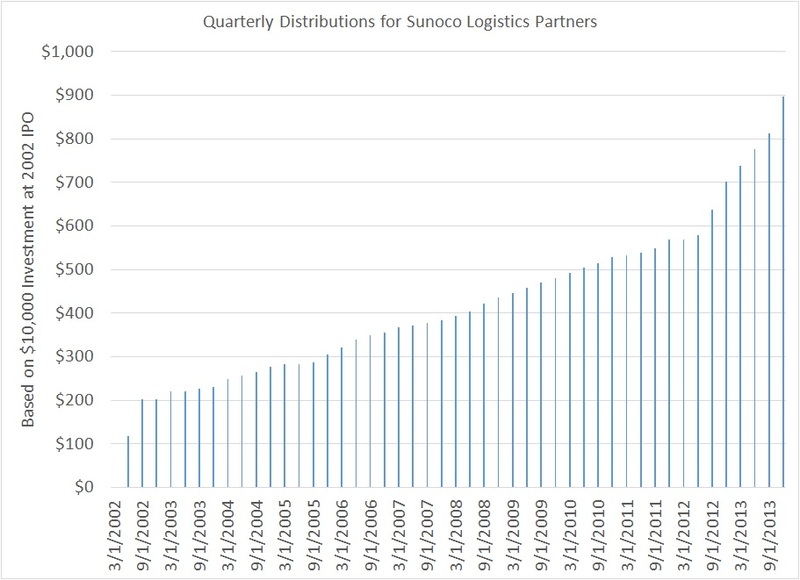 Through the end of 2002, Sunoco Logistics Partners disbursed a quarterly distribution of $0.15 per unit. However, as the MLP began to grow its cash flow via acquisitions and asset expansions, the firm’s distribution increased at a steady clip. Sunoco had a strong incentive to pursue policies that would enable Sunoco Logistics Partners to grow its quarterly payout to more than $0.2333 per unit; at this threshold, the general partner receives half of the limited partner’s incremental distribution growth. Sunoco Logistics Partners reached this milestone–the so-called high splits–in the first quarter of 2006, about four years after its IPO. Much of this distribution growth stemmed from a series of third-party acquisitions and three asset drop-downs from the MLP’s general partner. Drop-down transactions from an MLP’s general partner usually represent a low-risk growth driver because of management’s familiarity with these assets. These deals are usually structured to be immediately accretive to the limited partner’s cash flow, enabling the MLP to grow its quarterly payout. Sunoco Logistics Partners, for example, boosted its distribution by 3.6 percent sequentially on the same day it finalized the acquisition to Sunoco’s Eagle Point Refinery. General partners with an extensive portfolio of MLP-eligible assets give their limited partners a visible pipeline of growth opportunities. Meanwhile, the financial backing of a company the size of Sunoco undoubtedly also helped to lower Sunoco Logistics Partners’ cost of capital on its third-party transactions. The strong returns posted by units of Sunoco Logistics Partners after its IPO aren’t an isolated case. 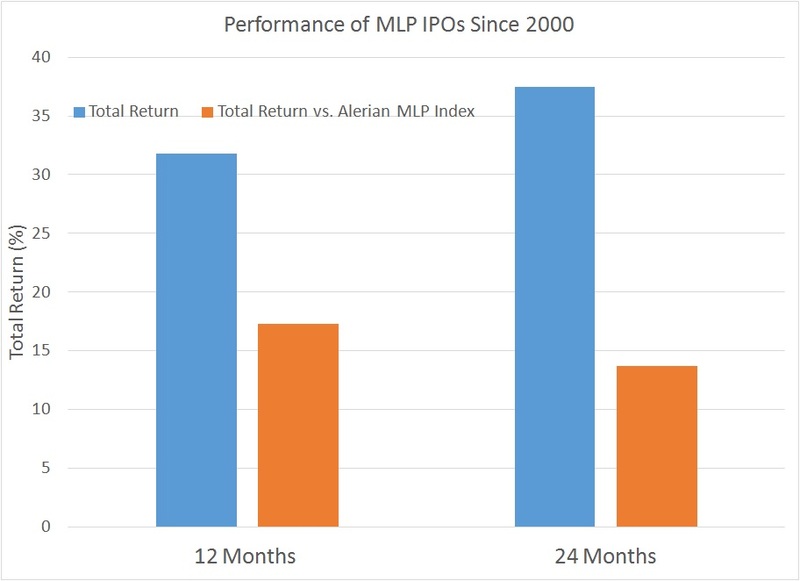 We studied all 87 MLP IPOs that have occurred since 2000 and calculated the total return generated by these fledgling stocks over the 12 and 24 months after its first day of trading, as well as the return posted by the Alerian MLP Index over an equivalent holding period. On average, the names in our study generated an average return of 31.8 percent in their first 12 months as public companies and 37.5 percent over the first 24 months. These gains outpaced the Alerian MLP Index’s average 12-month return of 17.3 percent and its average 24-month return of 13.7 percent. MLPs are typically structured to grow their payouts quickly in their first few years as publicly traded partnerships; rising distributions capture investors’ attention and drive price appreciation. By our count, more than half the publicly traded partnerships that have debuted since 2000 have benefited from a visible pipeline of drop-down transactions from their general partners. Because of tax complications, retail investors still dominate the MLP space. Until a new MLP pays its first distribution, many popular financial websites will register the stock’s yield at zero percent. The first distribution payment usually calls attention to the stock, giving investors who pay close attention to the pipeline of prospective publicly traded partnerships an opportunity to buy high-quality names before the crowd. Brokerage firms involved in an MLP’s IPOs can’t publish research on the stock until the mandated quiet period ends, at which point a raft of initiation reports drive trading volumes. Investors who take the time to comb through a prospective publicly traded partnership’s lengthy prospectus and S-1 registration statements can identify high-quality names that might fly under most investors’ radars. In a recent issue of Energy & Income Advisor, we delved into the MLP class of 2013 in considerable depth, highlighting the best of the bunch and several names that investors should avoid. Here’s our take on one name that might be worth your while; subscribers who want further details on the 18 energy-related MLPs that debuted last year should consult Rating the Master Limited Partnership IPOs of 2013. Not a subscriber to Energy & Income Advisor? Subscribe today for instant access to this valuable information. This publication also includes coverage of every energy-related MLP and model Portfolios for Conservative and Aggressive investors that highlight our favorite names. Marlin Midstream Partners LP (NSDQ: FISH), which went public on July 26, 2013, operates midstream infrastructure that handles natural gas (75 percent of annual gross margin) and crude oil (25 percent). The MLP’s natural-gas assets include two processing facilities in Panola Country, Texas, that have a combined capacity of 220 million cubic feet per day (mmcf/d), an 80 mmcf/d processing plant in Tyler County, a 65-mile gas gathering system in eastern Texas and two NGL pipelines. These plants process gas produced from the Cotton Valley Sands, the Haynesville Shale, the Austin Chalk and the Eaglebine. In a conference call to discuss Marlin Midstream Partners’ third-quarter results, CEO W. Keith Maxwell III indicated that permits for new wells in the acreage served by its systems in Panola County ticked up by 6 percent from year-ago levels, while overall permitting among its five largest customers jumped by 37 percent. And even if drilling activity were to slow in its operating areas, fee-based contracts that include minimum volume commitments would insulate the MLP’s distributable cash flow against this weakness. However, prospective investors should note that many of Marlin Midstream Partners’ gathering and processing contracts expire in three years or less, increasing the risk that the MLP might not be able to renew these agreements at similarly favorable terms. Improving NGL demand after petrochemical companies bring world-scale ethane crackers onstream could help to moderate some of this risk and support drilling in liquids-rich fields. Marlin Midstream Partners’ crude-oil logistics assets comprise two transloading facilities in Utah and Wyoming that transfer volumes from tanker trunks to railcars for transportation or tanks for storage. Much like the MLP’s gas-focused midstream assets, these transloading operations are backed by contracts that include minimum volume commitments and guarantee a fixed fee for each barrel handled. Drop-down transactions from its privately held sponsor and general partner, NuDevco Partners, should drive cash flow and distribution growth for Marlin Midstream Partners in coming years; the MLP has the right of first offer on any midstream assets that the parent develops over the next five years. In the near term, the crude-oil segment presents the best growth opportunities. Management has highlighted customer interest in an expansion of its Wildcat transloading facility in Utah and the installation of heated oil tanks to handle the waxy crude oil produced in the Uinta Basin. 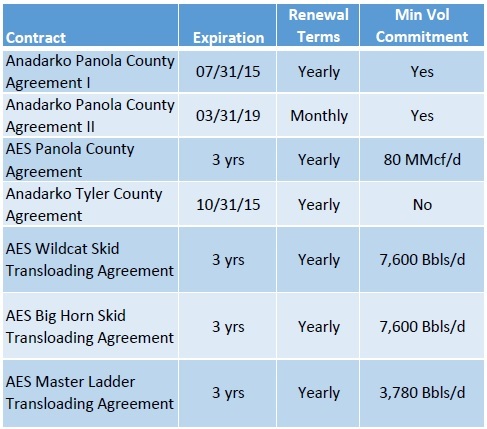 NuDevco Partners holds eight transloaders that are prime drop-down candidates; in fact, Marlin Midstream Partners has already signed a letter of intent to purchase one for $45 million. In its first partial quarter as a publicly traded entity, Marlin Midstream Partners paid a prorated distribution of $0.23 per unit, equivalent to the minimum quarterly distribution of $0.35 per unit contemplated in its prospectus. Over this short period, the MLP generated enough cash flow to cover this payout by 131 percent–well above management’s stated target of 110 percent. Despite a solid third quarter, the stock has given up 18.3 percent of its value since Marlin Midstream Partners went public in July. This disappointing performance likely reflects the MLP’s market capitalization of less than $300 million and a general partner that’s closely controlled by Marlin Midstream Partners’ CEO. Marlin Midstream Partners could be worth a nibble for speculative investors who have the stomach for volatility.